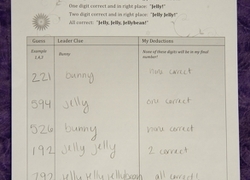 Easter word problems get your kid to help Nick with his jellybeans and Glenda with her eggs. Work on math and reading with this Easter word problems worksheet. Our Easter word problems are great for young mathematicians that are excited for the holiday. Help your kid practice basic math with our Easter math worksheet. Hunt for the solution in these Easter word problems! Kids will practice reading as they work out these addition and subtraction problems. Celebrate Easter with some math! Your first grader will read word problems and then solve basic addition equations. Here are some sweet Easter problems to keep your child busy this holiday! He'll use his reading comprehension skills to solve these word problems. It's Easter, but these kids still have practical math to do. Help the kids in these exercises calculate the number of chocolates, eggs, and flowers they have. Here's an Easter themed math game to reinforce your child's logical reasoning and place value skills.